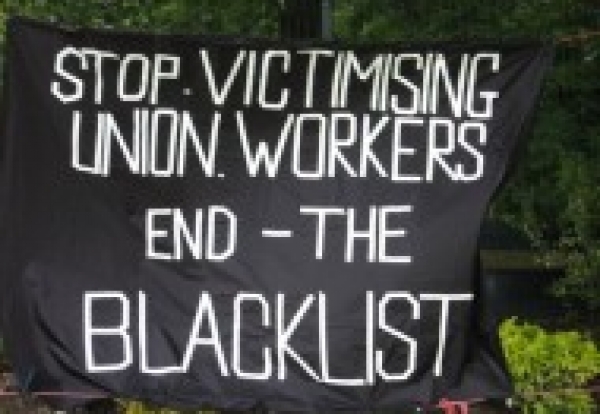 The scheme to compensate blacklisted workers is being launched today after eight months of talks between construction unions and contractors. The Construction Workers Compensation Scheme, being supported by eight main contractors, is now open to claims from more than 3,000 blacklisted workers for the next two years. The minimum payment for anybody appearing on The Consulting Association database will be £4,000, rising to £20,000 where there is evidence that records had been accessed . Claims above this will be assessed by a former judge with a potential maximum payout of £100,000. The companies – Balfour Beatty, Carillion, Costain, Kier, Laing O’Rourke, Sir Robert McAlpine, Skanska UK and VINCI – are all “apologising for their involvement with TCA”. It is being launched without agreement from the main construction unions which complain the package is still not sufficient compensation and estimate it will cost contractors £15m-£20m in total. All firms have also pledged to sign up to a voluntary code of conduct that is being developed by the Chartered Institute of Personnel and Development to ensure full transparency in pre-employment vetting processes. Contractors have also pledged to offering refresher training where necessary to ensure that the skills, knowledge and certification of affected workers is up-to-date. The scheme provides two options for accessing compensation – fast-track and full review. Offering fixed levels of compensation, the fast-track is designed for those looking for a fast payment against fixed criteria, or for those where only very basic information was held. Under the fast-track route, successful applicants will receive payments starting at £4,000 when only very basic information, such as a name and region, is held rising to a maximum of £20,000 when evidence exists that records were accessed to the applicant’s detriment. Under the fast track process applicants simply need to be able to demonstrate they are the person listed on the records; they do not need to prove loss of earnings as awards are based solely on the information held. Once an applicant knows they are eligible and decides to join the fast track, they will receive their compensation payment within two weeks. The full review process is an alternative process for those people where there is evidence that their records were accessed and who would prefer a more detailed investigation of their particular circumstances. The full review provides the opportunity to submit evidence of the impact of TCA records on the individual’s employment. These claims will be assessed by Sir Colin McKay, a highly respected retired High Court judge, who is completely independent of TCWCS and the eight companies. Sir Colin McKay will review each application and determine compensation up to a maximum of £100,000 for any individual claimant. Under full review, TCWCS anticipates the assessment of the claim and payment of compensation will be completed within three to six months. This is significantly faster than the High Court process. Once an applicant has established that their name was held on TCA records, the scheme covers the cost of independent legal advice to help the applicant decide which option, fast track or full review, is best for their particular claim and circumstances. If an applicant already has a claim in the courts and would like to withdraw to join the scheme, TCWCS will also cover reasonable legal costs accrued to date. The scheme is being run by an independent administration specialist. The application and claims handling process has been made as simple as possible with online, postal and telephone services available. Full details of the terms of the scheme can be found at www.tcwcs.co.uk. Any construction worker, or the family of a deceased construction worker, who believes they may have been affected can download an initial enquiry form, which is also available from the TCWCS free-phone helpline on 0800 980 8337. The helpline will be open on Saturday 5 and Sunday 6 July from 9am-5pm in addition to the normal weekdays opening hours.